When I get to sip on something sweet and pink, it feels tres chic. This has proven true time and again as I have made this delicate and sophisticated strawberry soup. 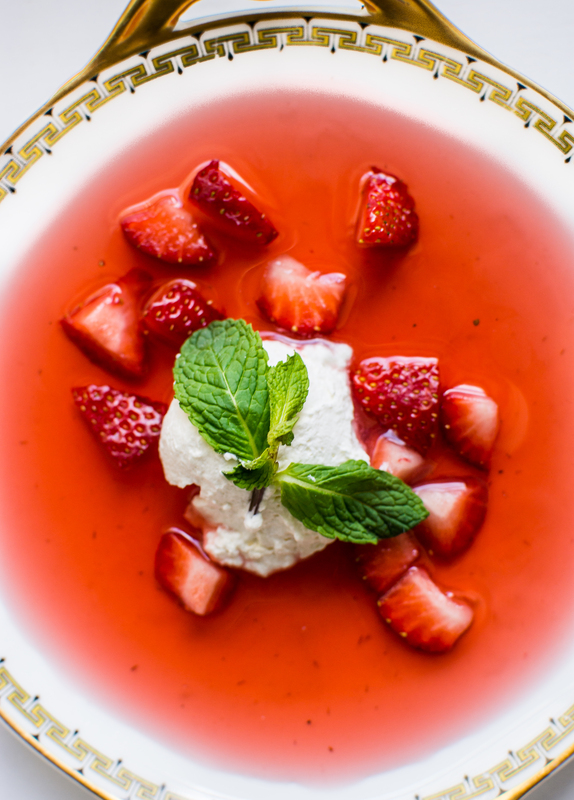 Whether it’s been a bridal shower, baby shower luncheon or a holiday dessert—this strawberry soup has been a show stopper. To clear up any confusion, this is not a gazpacho or a salsa. The strawberries are not pureed or juiced—they are actually stewed for an hour. 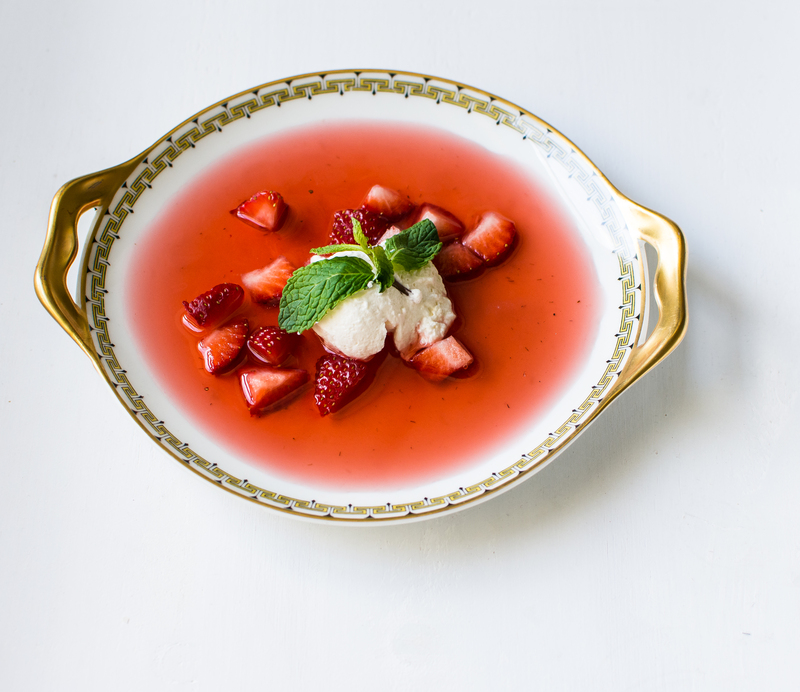 With this stewing process, the strawberries release their juice creating a concentrated, light yet bold syrup that is perfect for sipping on. One key to a great strawberry soup is selecting ripe and sweet strawberries. 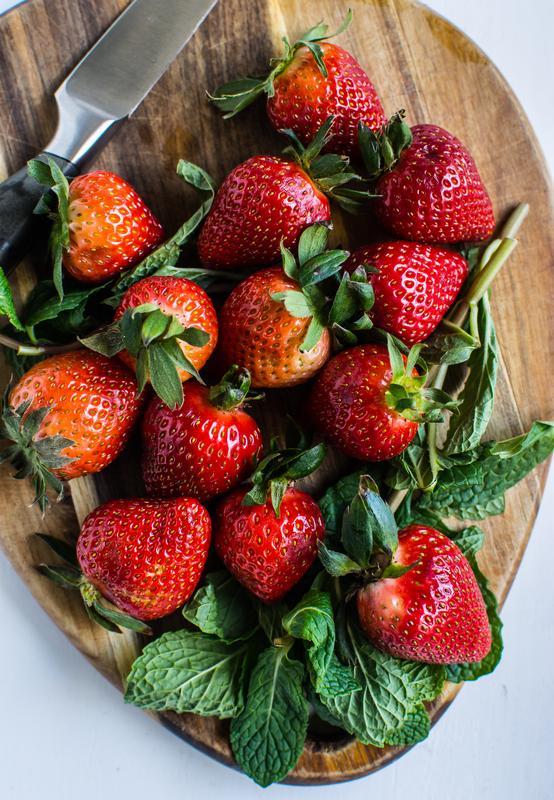 Market Street currently has a wonderful selection of freshly ripened strawberries, perfect for creating a deliciously flavorful chilled soup. While at Market Street collecting your show stopping ingredients be sure to grab organic mint leaves to top off this delicate treat. You’ll need to wander over to the spice aisle to grab some critical aromatics for this recipe: fresh vanilla beans, cardamom pods (don’t be afraid of this ingredient—it’s very similar to cinnamon!) and mint extract. While you may not use these ingredients every day, you’ll find that these ingredients MAKE this soup have layers of flavor and depth. When making this soup you’ll also need a few other pieces of equipment (if you don’t already have it at home), all of which you can get at Market Street. 3—fine mesh strainer Isn’t it great having a catch-all grocery store? Market Street is a shop that not only provides for your basic cooking needs but also for those tabletop goodies (like fresh flowers and pretty plates) that are always necessary when you need to feel tres chic. Author note: This recipe is a slightly reworked version of a Strawberry Soup I found in Food and Wine Magazine. It is delicate, rich and perfect as a starter or finisher of any luncheon or dinner. 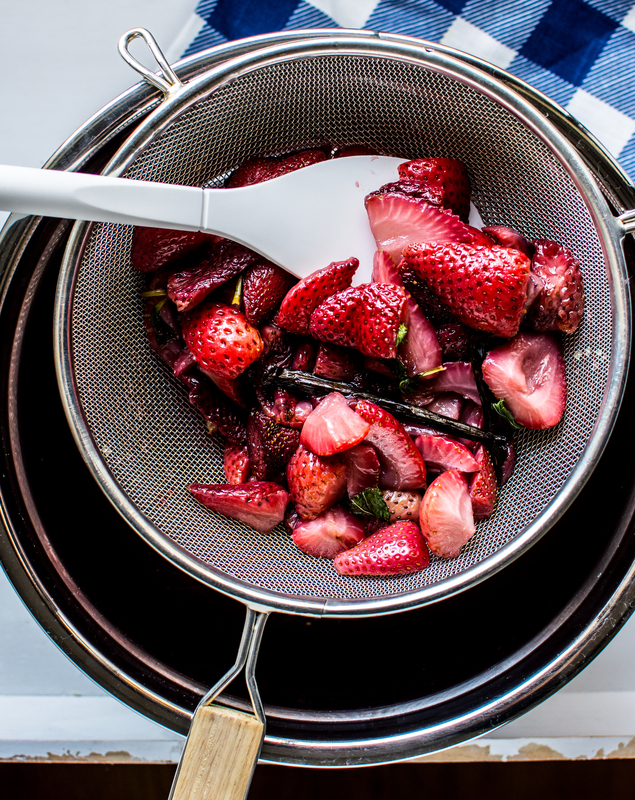 Place strawberries and all their juices into a medium-sized glass (or stainless steel) bowl. Stir in the sugar, vanilla bean and cardamom pods. Place plastic wrap over the top of the bowl and seal well. Fill a small sauce pan 1/2 inch full of water. Bring to a boil and reduce to a simmer. Place the bowl on top of the sauce pan to create a double boiler (make sure the water does not touch the bottom of the bowl). Stew the strawberries for 1 hour. Stir once. Carefully remove the bowl from the pan. Place the bowl into an ice bath and stir in the mint leaves into the strawberry mixture. Let the strawberries cool for 15-20 minutes. Strain the strawberry soup into a container. Continue to let the strawberry soup come to room temperature and then place in the fridge. Place the chopped strawberries into a small serving bowl. 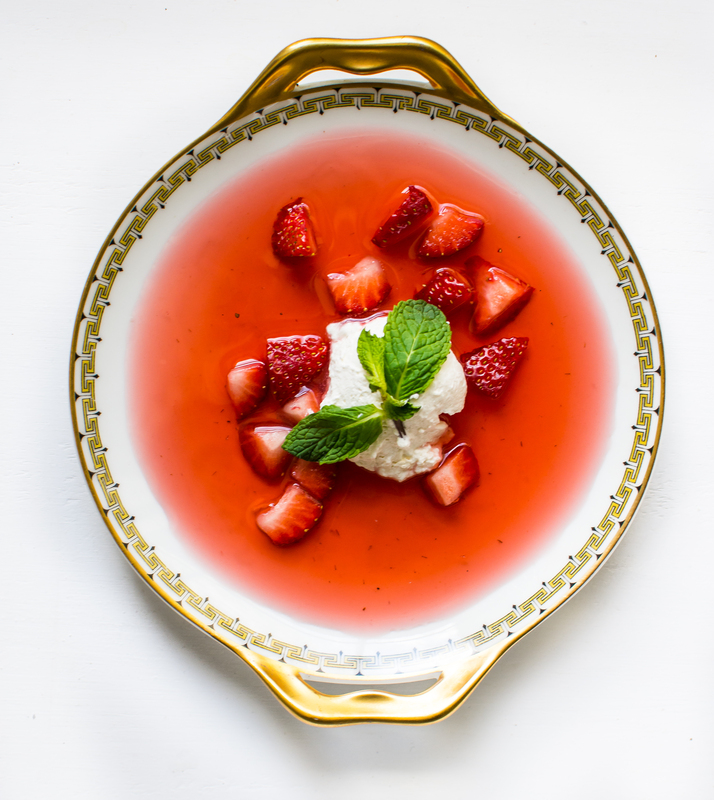 Top the strawberries with the soup, mint whipped cream and a mint leaf. Serve chilled. Using an electric mixer, whip on high until stiff peaks form, about 4-5 minutes. Serve immediately, or spoon out and place into a container. Store in fridge until ready to serve (up to 24 hours). Disclosure: This is a sponsored post on behalf of Market Street. All opinions are my own. This entry was tagged A Pleasant Little Kitchen strawberry soup, chic strawberry dessert, chilled strawberry soup, concentrated strawberry syrup, dallas blogger, dallas food blog, non chunky strawberry coups, smooth strawberry soup, strawberry dessert, strawberry soup, strawberry syrup. Bookmark the permalink.